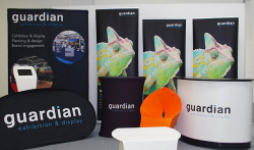 Whether it’s people, materials or products, here at Guardian Exhibition & Display we’re proud to work only with the very best quality. With this in mind, get ready to browse our comprehensive range of impactful display products! Whatever your event, whatever the size of your stand space and whatever your budget, here you’ll find absolutely everything you need to stand out from the crowd and make the perfect first impression. You’ll find we’ve also demystified the decision-making process by providing information, hints and recommendations with each product, so that by the time you’ve finished browsing, you’ll be left with some informed ideas about which display solution is best for your brand and ideal event. Whether you already know what you’re looking for, or you need a helping hand to come up with the right design brief, our team are always available to discuss your requirements in person. Simply contact us to start a conversation – your route to display excellence just couldn’t be simpler!